Is This Britains Most Expensive Car Crash Ever? If you think you’re having a bad day this may very well change your mind! 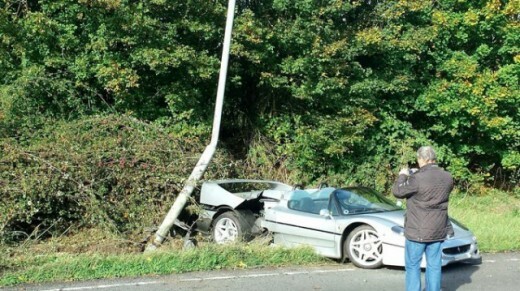 On Wednesday morning a Ferrari F50 ended up wrapped around a lamppost on the A43 near Brackley in what could be one of the most expensive single car crashes to take place on the UKs roads. The driver is thought to have lost control after entering a duel carriage way. The car, one of only 349 ever made, is worth over £850,000 and was built by Ferrari to celebrate the car makers 50th anniversary in the 1990’s. It can reach speeds 202 mph and goes from 0-60 in 3.6 seconds.